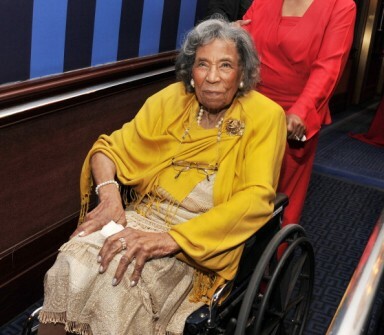 Official Site of the AMELIA BOYNTON ROBINSON FOUNDATION & the Centennial Birthday Celebration IN ATLANTA, GA.
Amelia Boynton Robinson (1911- ) is a leading civil rights activist who played a key role in efforts that led to passage of the 1965 Voting Rights Act. Can you imagine American citizens suffering all manner of repression for more than 60 years - just to be a citizen, and not to be considered chattel? The struggle did not begin nor end with getting the right to vote as a first-class citizen in 1965. Strangely enough, this freedom or privilege was purchased by people of all races who gave themselves: Blood, sweat, tears, as well as death, paying the supreme price for freedom. There are unsung heroes and heroines whom we will never know. Civil rights pioneer Amelia Boynton Robinson is perhaps best known as the woman at the front of the March 7, 1965 “Bloody Sunday” march in Selma, Alabama. 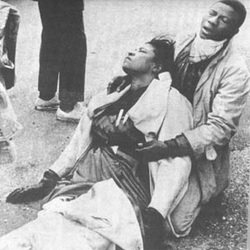 Robinson was gassed, beaten, and left for dead that day on Edmund Pettus Bridge. 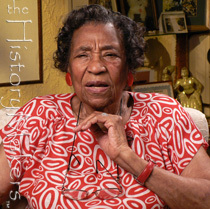 Interview with Amelia Boynton Robinson, conducted by Blackside, Inc. on December 6, 1985, for Eyes on the Prize: America's Civil Rights Years (1954-1965). Washington University Libraries, Film and Media Archive, Henry Hampton Collection. "Her Love of Freedom is a Higher Power"
Dr. Amelia Boynton Robinson was the special guest of House of Representatives, the Honorable Terri Sewell (first Black Female Congresswoman from Alabama). She attended the State of the Union Address, delivered by President Barak Obama. 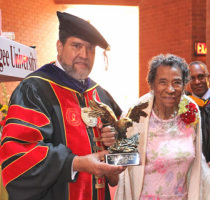 Civil rights legend Amelia Boynton Robinson was acknowledged for her continuous service and dedication. Known as the matriarch of voter’s rights, she received the Booker T. Washington Legacy Award. 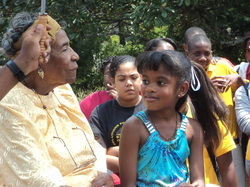 On August 18th and 19th, Dr. Amelia Platts Boynton-Robinson celebrated her 100th birthday. This took place in both Tuskegee, Alabama and Atlanta, Georgia. Click the title for articles, pictures and video. We were blessed with the presence of a National Civil Rights treasure, Ms. Amelia Boynton Robinson. 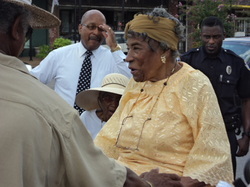 At 101 years young, she spoke eloquently to all the marchers today, in front of Selma’s Southside High school. This was the midpoint of the day’s march but a true highlight for all of us. 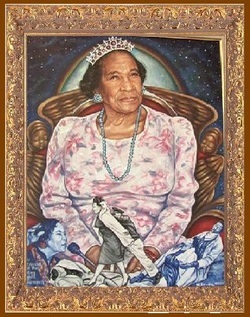 Queen Amelia Boynton Robinson marches for Justice in 2012. She joins the voices across the state of Alabama in protesting the new Immigration laws. You can't judge the living history book that is Amelia Boynton Robinson by her gentle cover. "They said 'don't rock the boat'," Robinson said. "I tried my best to do everything but turn it over." 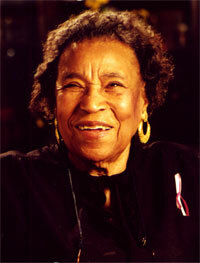 The Tuskegee, Alabama Village of Hope (VOH) is based on the vision of legendary civil rights leader Mrs. Amelia Platts Boynton Robinson, who began a freedom struggle for herself and others at age 9 in Savannah, Georgia. Civil rights pioneer Amelia Boynton Robinson was born on August 18, 1911 in Savannah, Georgia. As a young lady, Robinson became very active in women's suffrage. In1934, at the age of twenty-three, Robinson became one of the few registered African American voters. 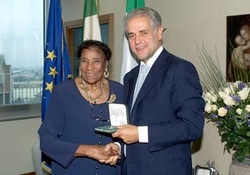 Amelia Boynton-Robinson's Facebook page with biography, photos and more. Born in Georgia, she became involved as a young woman in campaigning for women's suffrage. She and her husband, Bill Boynton, knew George Washington Carver at the Tuskegee Institute. 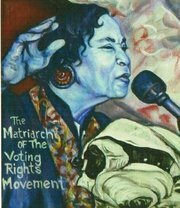 "Vote-less People is a Hopeless People"
Mrs. Robinson, a fighter for civil rights for nearly a century, is vice chairwoman of the Schiller Institute in the United States. Katherine Notley interviewed her on Feb. 15, shortly before Mrs. Robinson returned to Selma, Alabama to celebrate the 40th anniversary of a keystone battle for the right to vote—the 1965 Selma to Montgomery march, which had its baptism by fire on Bloody Sunday, March 7, 1965. Through the Years tells the story of Joshua Terrell, who, despite the harsh conditions of a slave's life, fights with courage and determination to win freedom and gain leadership in the U.S. Congress. It is in part autobiographical, as Mrs. Robinson's family boasts at least one Reconstruction-era U.S. Congressman. This site features a list of videos located on line for watching. There is a selection menu and a player for the media files.